Please remember to include your first and last name at the end of every message that you submit to the Forum. 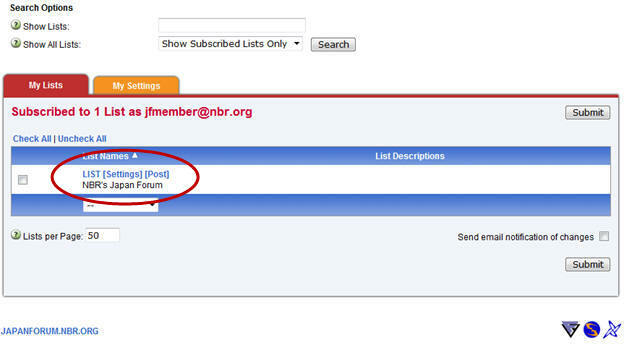 The email address for members to post a message to the Forum is LIST@japanforum.nbr.org. After you submit a message you should receive a confirmation email stating that your email has been received and is awaiting moderation. The Forum seeks to promote thoughtful and informative discussion. Please keep it civil: Respectful debate that focuses on the issues is fine, but ad hominem attacks have no place on the Forum. Although NBR's system is configured to remove member email addresses from email headers (please see Terms of Service for more information), contact and other personal information included in the body of an email (e.g., in a signature block) sent to the Forum will not be removed. How do I subscribe to the Japan Forum? How do I unsubscribe from the Japan Forum? Who moderates the Japan Forum? Why is my name not appearing in the "From" field of messages I send to the Forum? My "name" comes through as "Japan Forum Member" on messages that I send to the list. I am a subscriber and am able to post to the Forum when I reply to a message, but when I submit a new message my email bounces. I receive messages that others post to the Forum, but when I try to reply to or submit a new email I receive an error saying that my submission was rejected because I am not a member. The moderator tells me that my message was approved and sent to the list, but I never received a copy of the approved message in my inbox. Why did the moderator reject my post? How do I change my subscription settings (change email address, temporarily suspend mail delivery, etc.) on the Japan Forum? To subscribe to the Forum, please visit https://japanforum.nbr.org/scripts/wa.exe?SUBED1=LIST&A=1, enter your name and email address, and click "Subscribe." You will receive a confirmation email with a link to the Forum's Terms of Service. The easiest way to cancel your Forum subscription is to send an email from your subscribed email address to LIST-signoff-request@JAPANFORUM.NBR.ORG. 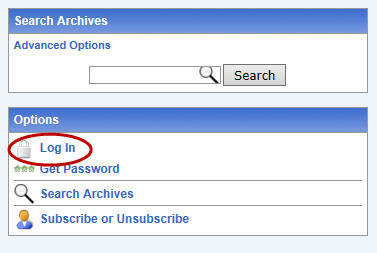 Alternatively, you can change your subscription options by logging into the Forum's website. Dr. John Campbell, Emeritus Professor, Department of Political Science, University of Michigan--and Japan Forum member since 2001--is the moderator. Occasionally, John is assisted by back-up moderators who serve on the Forum's Advisory Board. In order for your name to appear in the "From" field of a message that you submit to the Forum, your name must exist in the "Name" (sometimes called "Display Name") field in your email client (desktop clients such as Outlook or web clients for Gmail, Yahoo, Hotmail, etc.). If this field is blank, or if it contains your email address instead of your name, the Forum's list software will use the generic name "Japan Forum Member." Please make sure you are using the correct email address. 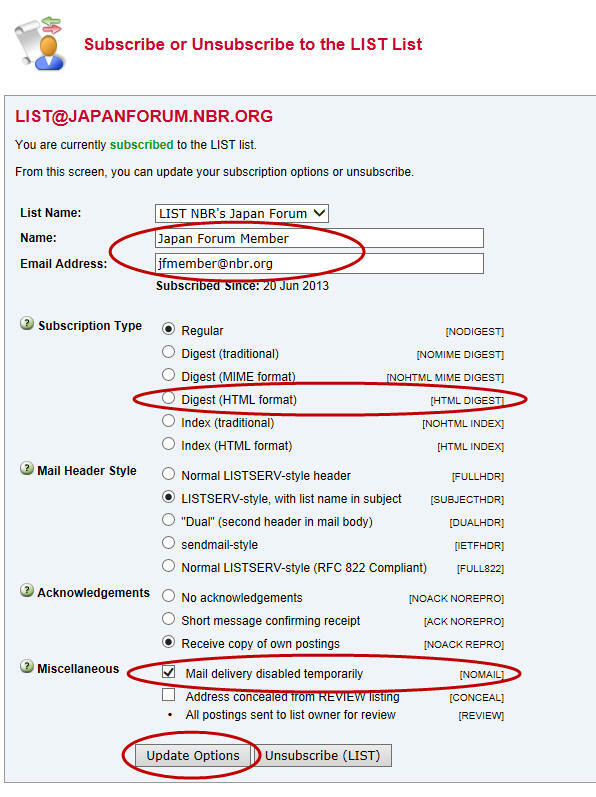 The correct address for submitting a message to the Forum is LIST@japanforum.nbr.org. 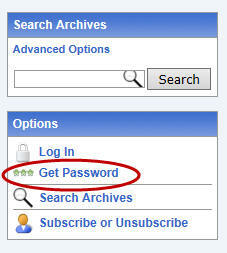 Make sure that the email account you are using to send your message is subscribed to the Forum. Members sometimes subscribe to the Forum using an email address that automatically forwards to another address. For example, Jane Smith might have a personalized email address (e.g., "jane@janesmith.com") that automatically forwards all incoming email to her Gmail account. If Jane subscribes to the Forum using "jane@janesmith.com" but then replies to a message using her Gmail account, the Forum list's software will reject her message because her Gmail account is not recognized. In addition, the system can send a confirmation email when/if your message is approved by the moderator: "Your message of (date/time) and Subject: (subject_line) has been successfully posted to the list." If you do not currently receive this message when your posts are approved, please contact japanforum@nbr.org for assistance. If a message does not meet these criteria, the moderator will reject the message. In principle, the moderator will notify the author of the rejection. At his discretion, the moderator may ask the author to revise and resubmit. 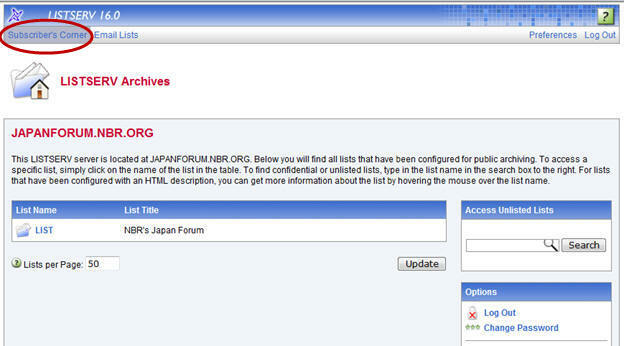 For more information, please review the Japan Forum's Terms of Service. 1) Click the "Get Password" link on the right side of the page. 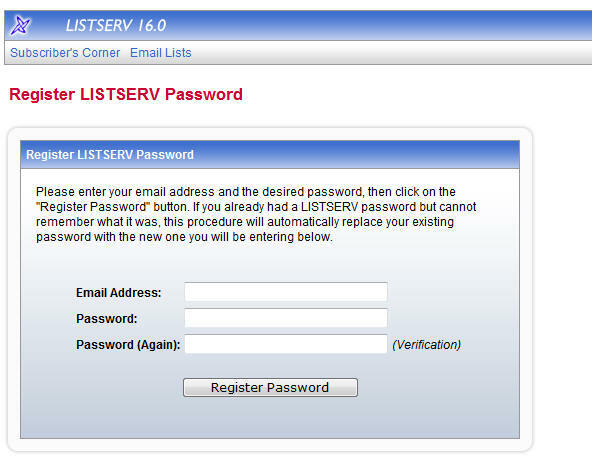 2) Enter your registered email address and set your desired password. 3) Log in to the website using the "Log In" link on this page: https://japanforum.nbr.org/scripts/wa.exe?A0=LIST. 4) "Access the Subscriber's Corner," and choose "Settings." 5) Change and update your settings. After making your desired changes, click the "Update Options" button to save.